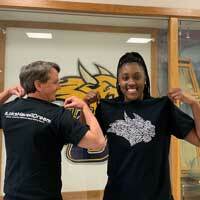 T-shirt designer and Webster University basketball player Darieana Hunter shows off her shirt along with Webster Athletics Director Scott Kilgallon. ST. LOUIS – The Webster University women’s and men’s basketball teams will be celebrating Black History Month by throwing out special t-shirts during the home doubleheader with Greenville University at Grant Gymnasium on Saturday, Feb. 16. The women’s game will tip-off at 1 p.m., with the men’s game to follow at 3 p.m. The t-shirts, which were designed by sophomore women’s basketball player Darieana Hunter (Norman, Okla./Norman), are black and feature a white Gorlok logo on the front with words that encourage and promote diversity and inclusion. On the back, the shirt says, #LoksHaveADream and Webster University Celebrates Black History Month. At Saturday’s women’s and men’s basketball games, the Webster cheerleaders will throw the special t-shirts to the fans throughout both games. The Gorlok women come into Saturday’s game sporting a 17-7 overall record and are in fourth place in the St. Louis Intercollegiate Athletic Conference standings with a 10-5 record, while the Gorlok men come into the game with a 17-6 overall record and are tied with Greenville for first place in the league standings with a 13-3 record.